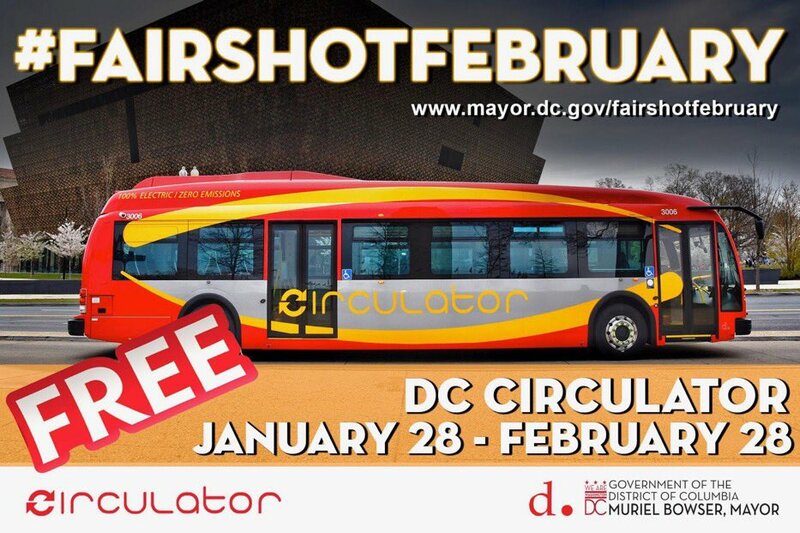 Washington, D.C. Mayor Muriel Bowser has announced that all rides on the D.C. Circulator bus will be free of charge from January 28 until February 28 as part of her #FairShotFebruary campaign. D.C. Circular connects residents to the District’s main attractions, including business, culture and entertainment corridors. “We’re kicking off Fair Shot February by making it easier for Washingtonians to get where they need to go and connect to opportunities across DC. A free Circulator is one way we can use our resources to break down barriers to opportunity—but it’s certainly not the only way,” Bowser said in a statement. “Throughout February and before I send my budget to the [City] Council, I hope Washingtonians from across all eight wards will join us at our Budget Engagement Forums to build on this initiative by sharing their priorities and ideas for making our city’s prosperity more inclusive,” Bowser added. Over five million trips are undertaken via D.C. Circular system, which runs six district routes across D.C. and into Rosslyn and Virginia. To find your closest Circular stop to any D.C. destination, visit Circular’s interactive map.